Cute little snowman ornaments we made today. The white part is fingers, can you tell? 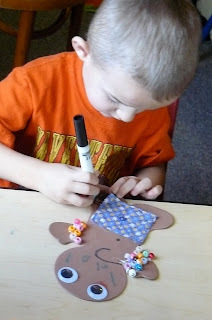 We also decorated fun foam gingerbread babies after reading ” The Gingerbread Baby” by Jan Brett. 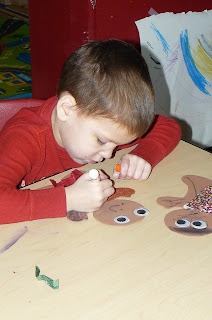 We did the ” Gingerbread Man” when we had a unit on fairy tales . We will also visit one of the Gingerbread stories again after Christmas break while we explore many of Jan Brett’s masterpieces. Revisiting the same activities and books is a good thing for preschoolers. They can start to put more pieces together and sometimes have completely different experiences as they develop and begin to comprehend better. The kids LOVE this little fisher price nativity…. Tomorrow is PJ Day and our Polar Express Party! I hope you got a photo with the hat on Mom's head!! I love it when our parents can spend some time with us, it doesn't happen to often, but when it does all the kids really enjoy it!! I missed it….. ( the picture ) bummer. 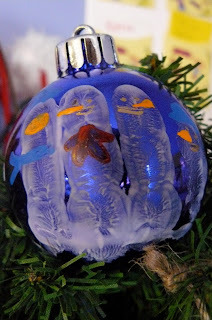 Headed tonight to get a new thingy…heh.. to upload my pics from. I have never had as much " mommy participation " as this year and I LOVE It. Awww the pic of you holding Audrey…she looks so cold 🙂 Great picture of you and the baby though! Audrey didnt feel well…. bummer. I had just called her momma.